Love these Chux Bathroom Duets. Multi sided cleaning products. One side will scrub clean without scratching porcelain or bench services. The other side wipes services clean and removes residue. The other cloth is ideal for cleaning glass or mirrors and works superbly with water alone. These bathroom duets are a must for my cleaning routing. These chux are so wonderful. Its thickness makebit easier to clean the wall surface in my bathroom and sink. Using these for over 2 years now. I was given a sample of these bathroom duets to try. While they are quick thick, and good on sink and wall surfaces, I would not recommend them for scrubbing. Only wiping over. This is the best product because you use simple water and the cloths. Cleans glass and mirrors so well. I got mine as a sample and haven’t needed to purchase yet. Still using the sample. I received a sample of this product in the mail. Wow! What a great way to clean my windows and mirrors with just water. I would definitely recommend this product and I have to friends who tried it too and love it! Just like the kitchen duets this one came in a showbag and was glad to try it . I found no benefits in having two clothes , but did find the good thing was the rougher cloth did some justice on the shower screens and made wiping the scums a bit easier . I have been using these in our apartment the past few months and love how easy yet effective these products are. The dry cloth can be wiped over really grubby bathroom mirrors and will shine up beautifully after only a moment. For stubborn stains or for shower glass you simply use the wet cloth and then the dry one after if you desire. We moved into a rental property, and the glass shower screens were filthy. Purchased a packet of bathroom duets, and they can up like new! I use these once a week to clean the showers and they look sparkling clean! 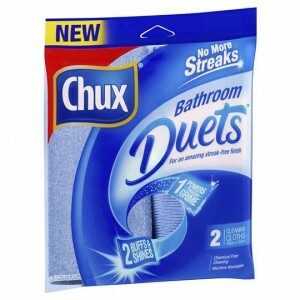 How would you rate Chux Bathroom Duets?